Florence is the capital of the Tuscany region of Italy. It's also considered to be a cultural, architectural, and art capital for the area, and it attracts many visitors of all ages. Florence has many galleries, historical buildings, and restaurants that all make it a wonderful and interesting place to visit. 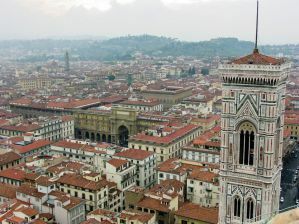 If you're a budget traveler or backpacker, you'll find many hostels or affordable guesthouses in the heart of Florence. Many options are conveniently located near most of the city's major tourist attractions. There are a wide range of hostel types, but if you're looking for a quiet setting where you can rest after a busy day exploring the city, then several good options are listed below. A welcoming, family owned hostel. My Friends is a quiet and relaxing guesthouse in the middle of Florence. It's conveniently located just a few minutes from the Santa Maria Novella train station and it is about a ten minute walk from many of the city's main attractions. It's also very close to the congress palace. The hostel is designed to be a welcoming and relaxing place for budget travelers who want to meet other guests but don't want a party atmosphere. There is a mellow and relaxed environment that makes it easy to hang out with everyone, but you can still be assured a good nights sleep in a comfortable and homey setting. You'll be welcomed here with warm hospitality. The owner, Nadrina, goes out of her way to make sure your stay is enjoyable. Because this is a smaller hostel, you can enjoy a very personal and intimate atmosphere. You'll quickly feel like you've found a second family during your travels here. A small and affordable hostel. David Inn is another small and quaint hostel that has a welcoming and friendly atmosphere. It's located right in the heart of the city and is between Michelangelos David and the Duomo. It's also less than a fifteen minute walk from the train station. The staff here keep the hostel comfortable and respectful. They speak several languages including English and Spanish, and they can recommend all kinds of things to do and see around town. The hostel has all of the standard amenities available including free wi-fi throughout and public computers. There's a shared kitchen which guests can use to prepare their own meals as well. If you're looking for a simple but friendly place to stay where you can be assured a good nights sleep, then this is a great option. The hostel is well located, the rooms are clean, and the price is affordable. Overall, it's a good option in Florence. 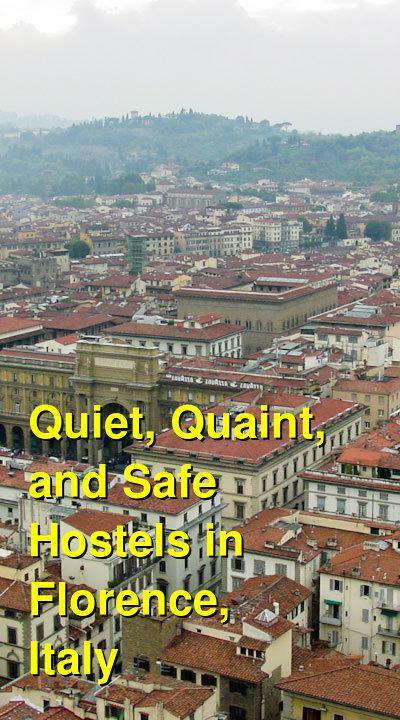 A quiet and comfortable hostel in the heart of Florence. Leonardo House is another popular option for travelers who want somewhere quiet and relaxing to stay in Florence. The hostel is conveniently located just three minutes from the Santa Maria Novella Train Station and it's only a minute from the Duomo and five minutes from Ponte Vecchio and the Uffizi Gallery. Leonardo House is a quiet setting where you can be assured a restful nights sleep. The rooms are set back from the noises of the street and each room has comfortable beds and good amenities. The hostel also offers free wi-fi and travel information for guests. The staff can help you with any ticket reservations you might want to make including reservations for the Uffizi. If you want to arrange any tours of the area, they can help with those as well. Options include wine tours around the Chianti region, trips to Cinque Terre, and horseback riding through the countryside. Private rooms include twins, doubles, and three bed rooms. Dorms sleep up to four people and female only rooms are available. If you're looking for a clean, comfortable, and quiet place to stay right in the heart of Florence, Leonardo House is a great option.